The importance that credit cards have, is increasing. They are becoming useful in our lives or I must say they are turning into a necessary thing to have. In fact, with digitalization, benefits of credit cards are increasing. They make you free from carrying loads of cash with you when shopping is concerned. On another side, online transactions such as online shopping totally dependent upon them. 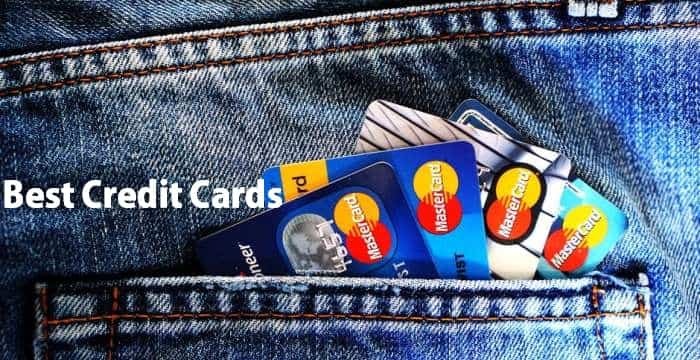 So, I have collected the list of best credit cards for online shopping & compared them all with each other to provide you the list of top 10 credit cards in India 2019. Though everyone has different purpose of getting a credit card and the best choice also changes with the purpose. But, lowest or no annual fees along with better rewards is something which you always want to get with a credit card as this is something, everyone can relate to. The motto of this post to help you to get the best credit card which has minimal annual charges and provides you highest benefits in name of reward points. In actual, it’s quite hard to get a credit card which has no annual fee but you can always get a card which is completely free for the first year. It makes you free from paying extra charges for the card, at least for the first year. Along with above benefits, there are dozens of other benefits that a credit card has. Yet, these are the top ones which directly affects the best choice. Top online shopping sites such as Amazon, Flipkart & Myntra & Offline stores such as Big Bazaar gives you extra cashback when you place your order using a credit card as payment method. The cashback/discount varies between 5-15%, which is a quite good discount one can get. In this case, credit cards turn in to a discount which is the best thing that I like about credit cards & you can see the effect of this in my list of best credit cards which you will find below. Moreover, it’s a common thing that you will get some extra reward points which every penny you spent using your credit card & you can redeem those reward points to get some freebies or to do some free shopping. Now after looking at benefits those I mentioned above, you must be wondering why don’t everyone get a credit card? what’s the catch? Let me tell you one thing, it looks very complicated for few peoples so they skip to get a credit card & moreover, charges & hidden fee is something which keeps most of the peoples away from credit cards. You can look at a few disadvantage that credit cards might have in worst cases. But, if you success to get the best credit card for your purpose which has minimal charges then I’m sure that these drawbacks won’t bother you. So let’s get started with the list. For frequent online shoppers, I will suggest that you go to SBI Simply Click Credit Card. And if you are looking for a card which has highest chances of approval with no annual fee then you should look for ICICI Bank Instant Credit Card or Standard Chartered Platinum Rewards Card. This is the #1 on this list of Best Credit Cards if your main motto is to save maximum on online shopping. There is a joining fee of Rs.499 on this card but that will be waived off if you spend over 1 lac rupees in the first year of getting approval. As a joining bonus, you will be also getting an amazon gift voucher worth Rs.500 which can be used to shop online at amazon. The gift card can be redeemed against any of your purchase at amazon, it is fully usable, means you can place an order worth rs.500 or less using this and you will have to pay nothing. As this credit card is focused on maximum online shopping benefits, you will earn 10X reward points on all your spends at Amazon, BookMyShow, Cleartrip, Foodpanda, Lenskart, UrbanClab & Zoomcar. You will also get 5X reward points for all other online spends. Reward points can be redeemed against a wide array of gifts from the rewards catalog. You will be also getting Rs.2000 worth of Cleartrip gift card if you spend over 1 lac or and another Rs.2000 gift card for spending over 2 lac INR in a year. So, in total, if you spend over 1 lac in a year then you will be eligible to get Cleartrip voucher of Rs.1000 and the annual fee will be also waived off. It will also give you 2.5% surcharge waiver on all your fuel spends but the transaction should be between Rs.500-5000 which is suitable for most of the users. Looking at all these benefits I can say this is the best credit card for online shopping with maximum benefits on online spends. Amazon & Flipkart also comes with exciting cashback/discount offers for SBI cards during festive sales which gives you extra 15% cashback on your purchases. So, it can be the best choice for frequent online shoppers. Standard Chartered Platinum Rewards Card should be your first choice if you want to get a credit card with a lifetime no annual fee. It will get you a lot of cashback and rewards when you spend using this card. Moreover, it’s the best credit card you can get by putting minimum efforts. If you get this card then you can avail 20% cashback on uber rides till 30th September 2018. Under that offer, you can avail up to Rs.600 cashback every month which means an extra saving of Rs.600 will be yours if you get this credit card. Furthermore, you can enjoy shopping at amazon & flipkart when there is any sale as during sale days you will see 15% cashback offer for your SCB Credit card which makes it the best credit card among all. Note: There will be a fee of Rs.250 on this card but that will be revered back if you make a transaction using this credit card within first 90 days. The reversal will be processed within 60 days which means you will be getting this credit card for free effectively. It’s another choice from Standard Chartered Bank which can be considered the best choice if you are “Okay” to pay Rs.499 as Joining fee which can be waived off if you spends over Rs.30,000 in the first year using your credit card. You will be also changed Rs.999 annual fee every year. However, it will be completely free for the first year and you can get the annual fee waived off by spending Rs.60,000 or more in a year. So, you need to be either ok with paying an annual fee of Rs.999 every year or be sure that you will be able to spend that much in a year (it’s not a big amount for most of the peoples). The best benefit of using this card is that it gives you 5% extra cashback on supermarkets and departmental stores. This cashback can be availed while purchasing groceries and other daily essential items from Big Bazaar, Reliance Fresh & other similar stores. Moreover, the Uber offer is also applicable to this card which gives you 20% cashback on uber rides. You can get up to Rs.7200 cashback on your uber rides using this card with maximum cashback of Rs.600 every month. As the name suggests, this credit card gives you extra cashback for all your bill spends done on this credit card. Let it be Telephone bill payment or utility payments made through Citibank Online Bill Pay service or movie tickets booking, you will get extra cashback on your every transaction. This cashback will be always yours whenever you make a transaction through this card. Beside it, you will also get extra cashback on many online portals as there are a lot of offers available on online merchants which are applicable only on Citibank cards. You can get up to 5% cashback on all your online spends. On movie tickets and bill payments, it will be 5% and .5% on all other spends. The only drawback with this cashback is that it is limited up to Rs.100/month. However, it is also enough for most of the peoples as it will take Rs.2000 worth of bill payment and bookings to reach the maximum cashback value of Rs.100. There is an annual fee of Rs.500 but in return, you will be getting cashback worth Rs.100 every month which is equal to Rs.1200 per year. You will also get a lot of online offers which can be used with Citibank cards which is another benefit of owning Citibank credit card. So you have to pay Rs.500 as the annual fee and in return, you will be benefited with cashback offers which give you benefits of Rs.1200 per year and extra .5% cashback on all your spends. This is the lifetime free credit card by ICICI bank. It needs no credit score in order to get approval, you can apply for this card against a Fixed deposit of Rs.20000 or more. There is no joining and annual fee on this credit card so it is the best choice for you if you are looking for a credit card with no joining fee and annual fee. When extra benefits are concerned, it gives you Extra 15% saving on dining and 1% fuel surcharge waiver. You can also get Rs.1000 discount on your transactions at Lenskart using this credit card. Moreover, you also get Rs.100 discount on movie tickets booking at bookmyshow, twice a month which means extra savings of Rs.200 every month. So, guys, this was my list of best credit cards in India. I have added all of my preferences here on this page. The only thing I have focused on is that which credit card is best for online shoppers for maximum cashback and other offers. The list is focused the most on credit cards which are best for online shopping to get a maximum possible discount on your transaction. As a secondary preference, I have chosen all those cards which have no annual fee along with easy approval process so one can get a credit card with least efforts. If you are looking for a credit card which can give you the most benefit while shopping online then you can go through this list. These are the best credit cards in India for online shopping.